true to size? is back with episode 05, and a very special episode to boot. With big launches back to back from Nike, Converse and a very special size?exclusive adidas Originals Archive piece. Kicking things off with a properly ’90s aesthetic, Nike’s ACG range gets a re-release and the colour-heavy capsule does not disappoint. As Morgan’s face tells you, this stuff is pretty special and comes at just the right time with a selection of lightweight jackets, big & bold tees and possibly the brightest pair of shorts on the market right now. adidas Originals’ size?exclusive Archive series continued this week with the launch of the first Trimm Star ‘VHS’ coming in a black suede upper, offset by multicoloured Three Stripes. Looking at the full pack in detail, we reveal the second of the two-part pack in the form of a white tumbled-leather version of the shoe. Next up, we take a closer look at the upcoming Converse x Tyler the Creator GLF*. Coming alongside a selection of apparel (stay tuned to @sizeofficial to see more of that! ), the four-shoe collection really hits the high notes where colour is concerned. With contrasting panels and the Tyler’s Flower replacing the iconic One Star, the shoes are set to return to size?previews on June 1st. And finally, we got our hands on the atmos x Nike ‘We Love Nike’ Air Max pack. 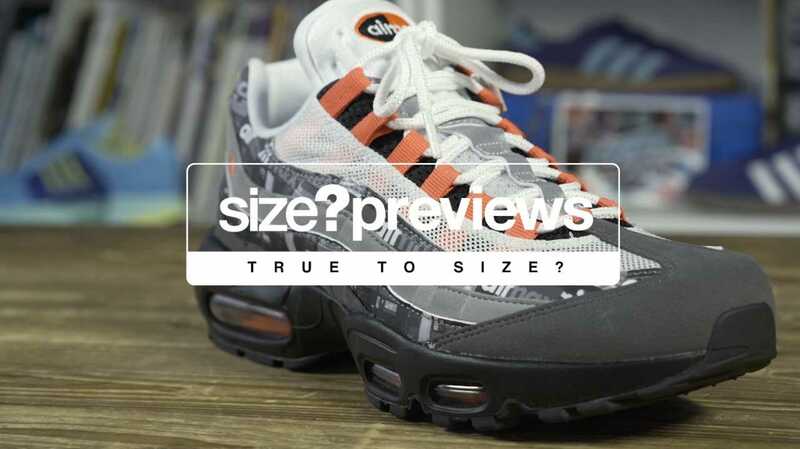 Getting to grips with two of the three silhouettes, the all over print silhouettes have split opinions within the community since their announcement due to their over the top shoebox print across the upper. Stay tuned to size?previews tomorrow, May 26th, for the release. As always, let us know what you think, and head over to size?TV for more.